Being your trusted business removalists partner, we take the pleasure of giving you useful insights and business relocation tips for you to have a positive experience in relocating your office. Thus, as one of the critical points, our clients need to know about moving offices. We’d like to give you a peace of mind about keeping your market after you move your enterprise. And in this article, we will talk about one critical item in your business relocation checklists and that is keeping your clients aware of your plan to move to a new location. If you’re anxious to lose your market after relocating your enterprise, well you don’t need to. They’re not going anywhere especially if they’ve been with you for a long time and you’ve long gained their trust. All you need to do is to let them know. Make sure that the word reaches them as well as reassuring that your relocation will not do any harm to them. How do you do that? Just follow these 9 Business Removalists ways to inform your clients about your relocation. Business removalists highlight the importance of keeping your move a positive thing for your clients. Also, ensure that they will not misinterpret this action plan of yours into something negative. Keep their impressions about you as high as before and make sure they think of this as a good thing. Another thing business removalists emphasise on is haste in spreading the word. Make sure your clients, suppliers and everybody will learn about this plan of yours at the quickest possible time. More importantly, those people whom you will be needing during the removal. Like your super cheap self storage Sydney partner. The media can be a great medium in spreading the word, business removalists says. Well, if you think about it, who doesn’t watch or listen to the news nowadays? 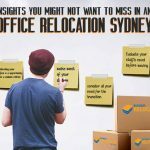 A week or a few days before your office relocation services company commence the removal, it would be best to update your website’s company address. So, it is indeed important to establish the new location for everyone, especially if you are expecting any deliveries or mails. Social media is also a big platform that you can’t miss out according to business removalists. Share to your social media pages and let people comment and share further. If you’re still sending out invoices, it would be worthwhile to include a little note anywhere on it about your plan to relocate. In this way, you can secure your client’s awareness. Just brace yourselves for phone lines, because there’ll be heaps of phone calls during this phase of your move. But that’s a good thing too. Just above your salutation message or below your signature, you can also write a small snippet talking about relocating your office. Since you will be making heaps of emails at this point too anyway. Make your new address echo out all over your blogs, postcards and every advisory you make, so that your clients and pretty much everyone will remember. Also, don’t forget to repeat your new contact information especially phone number. Don’t get tired of repeating yourself over and over again and you’ll be glad you didn’t after everything is all said and done. Make your grand opening a big deal and let everyone know about it too. Send out newsletters, post a new blog and let it be heard. Make promotions and deals in coming to your event. This is also a good thing in taking in new clients. Show your clients how much you value them. Keep them in the loop! Let them get the idea that even if you will be in a new location they can still reach you out easily. Business removalists see this as a very important thing for you to do. After all, establishing a new market takes a long time. Ergo, you need to make sure you still have your old market secured during the interim. Do You Want to Explore More Insights and Solutions? Just keep yourself posted on our blogs and catch up on older posts. You’ll surely find a lot of information that will be of great help in your endeavour. Also, are you having trouble dealing with all the legwork of moving? Then hire a business relocation agent to take care of your affairs.